Represent public company buyers and sellers and advise boards on shareholder activism, takeover preparedness, fiduciary duties, and SEC and stock exchange requirements. Calfee’s broad M&A practice includes a wealth of experience advising public companies and their boards in connection with mergers, acquisitions and other strategic transactions. In addition to representing public company buyers and sellers, we also have extensive experience advising boards on shareholder activism, takeover preparedness, fiduciary duties, and SEC and stock exchange requirements. Our lawyers have been involved in counseling all of the various parties involved in takeover proposals (bidders, targets, special committees, lenders, intervening bidders, financial advisors, etc. ), so we understand the perspectives of all of the players involved. Traditional counseling in this area is carefully balanced against the various fiduciary duty, corporate governance and investor relations perspectives, including for example the impact and likely response by institutional shareholder groups (including ISS) to certain strategies or protective measures. Our experience representing public company buyers and sellers, as well as their financial advisors, has provided us with the expertise needed to help clients successfully navigate the complexities of public company mergers and acquisitions. We have represented public companies in M&A transactions ranging in size from less than $5 million to more than $3 billion. We are also well equipped to provide assistance in preparing for shareholder activism and responding to activist campaigns (including proxy contests), fashioning appropriate responses to unsolicited proposals and to help prepare for a wide-range of potential outcomes in the event that the client ultimately determines to pursue a strategic transaction. 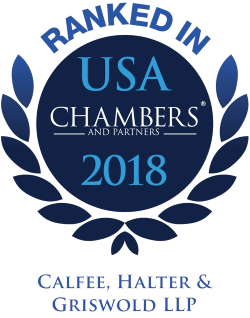 Calfee has been selected for inclusion in the 2018 Chambers USA "Leading Lawyers" for Corporate/M&A (Ohio Band 2). According to a recent edition of Chambers USA, Calfee’s M&A is known for being an "Impressive team with a strong track record across a broad range of corporate and transactional matters, acting on behalf of public and private businesses and financial institutions. Areas of excellence include M&A, securities offerings and private equity and venture capital fund formation. Also offers notable capital markets expertise, with particular strengths in acting for underwriters." "It's a high level of knowledge and sophistication, and they offer excellent client service and attention to detail." "They provide big-league legal service at medium market rates. It's good value for our money and, more importantly, they are trusted advisors."